Heart - Hemorrhage in a male F344/N rat from an acute study. 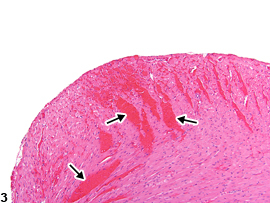 Extravasated erythrocytes are present in the myocardium (arrows). 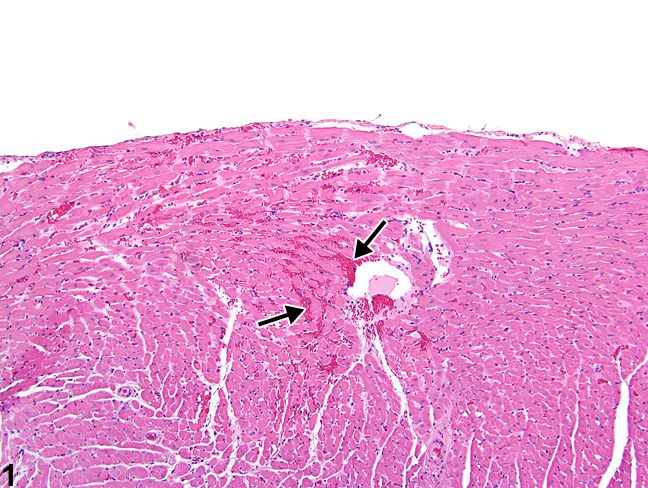 Heart - Hemorrhage in a male F344/N rat from an acute study (higher magnification of Figure 1). 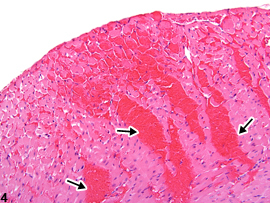 Extravasated erythrocytes separate cardiomyocytes (arrows). Heart - Hemorrhage in a male B6C3F1/N mouse from a subchronic study. 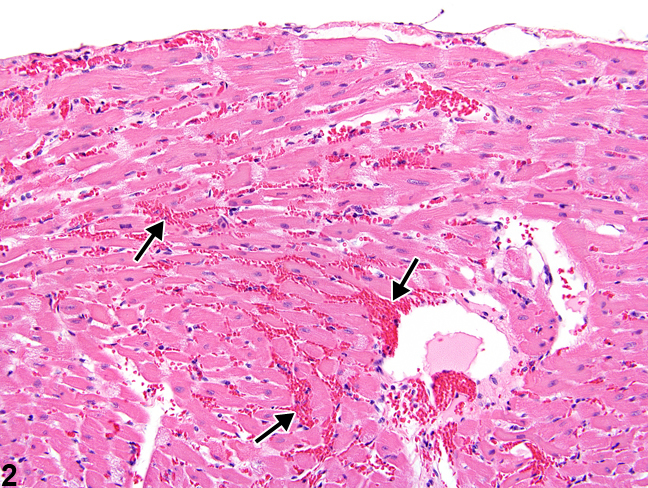 Large areas of extravascular red blood cells are present in the myocardium (arrows). Heart - Hemorrhage in a male B6C3F1/N mouse from a subchronic study (higher magnification of Figure 3). 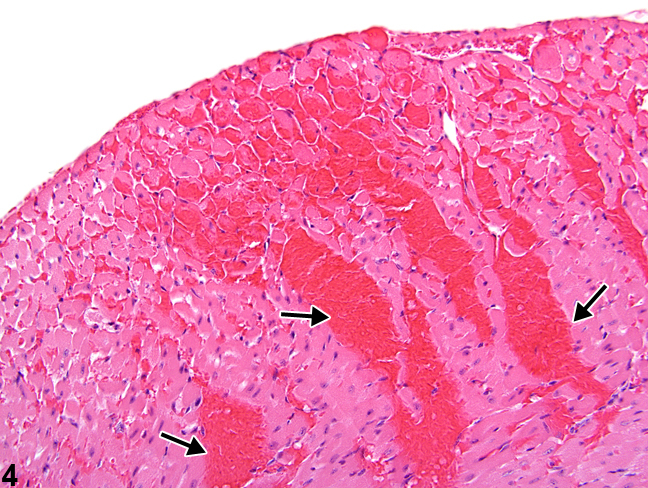 Large areas of extravascular erythrocytes separate cardiomyocytes (arrows). Hemorrhage consists of few to many small, irregular foci of extravasated erythrocytes scattered within the myocardium ( Figure 1 , Figure 2 , Figure 3 , and Figure 4 ). 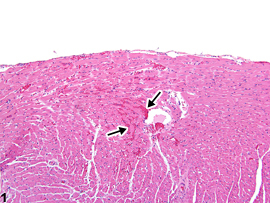 Myocardial hemorrhage may be accompanied by other morphologic manifestations of myocardial damage (i.e., necrosis, macrophage infiltration). The presence of hemorrhage and cellular necrosis may indicate vascular damage or vasoconstriction of small arterial vessels, or may represent myocytic toxicity. Hemosiderin-laden macrophages may be seen. Heart - Hemorrhage should be diagnosed and graded based on the extent of the lesion. The distribution of the hemorrhage (e.g., focal, multifocal, or diffuse), as well as the location (i.e., right ventricle, left ventricle, atrium, myocardium, papillary muscle), should be described in the narrative. If hemorrhage is secondary to another process such as inflammation or necrosis, it should not be diagnosed separately unless warranted by severity. Greaves P. 2000. Cardiovascular system. In: Histopathology of Preclinical Toxicity Studies (Greaves P, ed). Elsevier, Amsterdam, 254-311. Jokinen MP, Boyle M, Lieuallen WG, Johnson CL, Malarkey DE, Nyska A. 2011. Morphologic aspects of rodent cardiotoxicity in a retrospective evaluation of National Toxicology Program studies. Toxicol Pathol 39(5):850-860. Nyska A, Murphy E, Foley JF, Collins BJ, Petranka J, Howden R, Hanlon P, Dunnick JK. 2005. 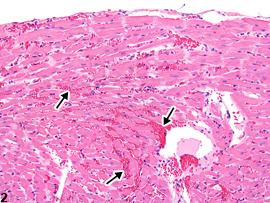 Acute hemorrhagic myocardial necrosis and sudden death of rats exposed to a combination of ephedrine and caffeine. Toxicol Sci 83:388-396.